Paris - The Eiffel Tower - Lights...What a romantic background for YOUR POEM! That's right - We will print your original poem in this romantic design. This Exclusive Poetry Gift is a perfect birthday or anniversary present for a husband, wife, or your special someone. We will personalize your poem with names, a special occasion date, and a loving message from you. 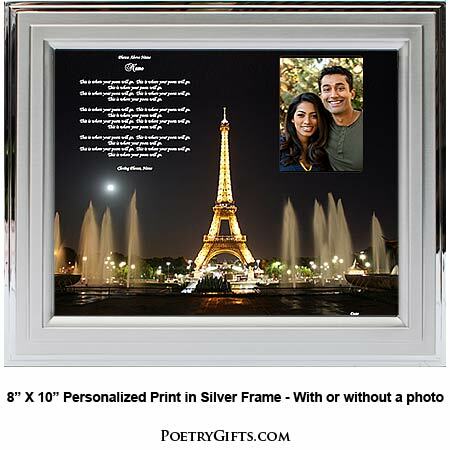 YOUR POEM in this beautiful Paris scene will be a personal keepsake for your spouse, boyfriend or girlfriend to treasure. Add a favorite photo in the cut-out area and you have a real Winner! What a great opportunity for you to express what's in your heart. We make it so easy for you. 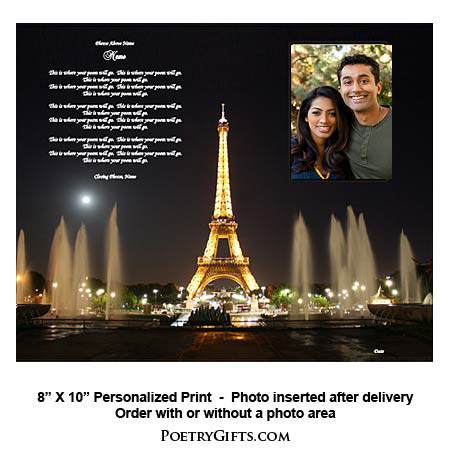 You write the poem and we personalize it and print it in this beautiful and romantic Paris scene. Perfect design for a love poem from you to your wife or husband. Maybe you and your spouse honeymooned in Paris or visiting Paris is on your "Bucket List." 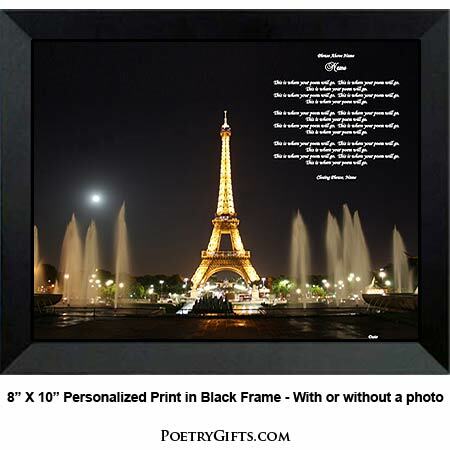 Imagine your poem in this beautiful Eiffel Tower night scene. What a thoughtful anniversary gift to give someone you love. Frame it yourself in any standard 8" x 10" picture frame or choose one of our contemporary frames. Makes a beautiful desk or table accessory. 3. Closing Phrase and Your Name (as seen after poem) - (Examples: All My Love, Rachel; Love Always, Nate; etc.)" Please look at the above design in order to determine a suitable poem length. We suggest your poem is 12 lines with a maximum of 16 words per line. There are no set rules; this is just a suggestion. If your poem is much longer than the length we are suggesting, the font/type will need to be made smaller to accommodate your entire poem. On the order form, please make sure to type your email address that you check often and phone number in case the designer needs to reach you with any questions. Unless you have permission from the author or poet, please only submit non-copyrighted materials.